For some reason I have stopped receiving notifications for thread updates. (Notifications are enabled.) I was going to suggest a double flour application but you have already reached the same conclusion. I think it looks much better having the second application. 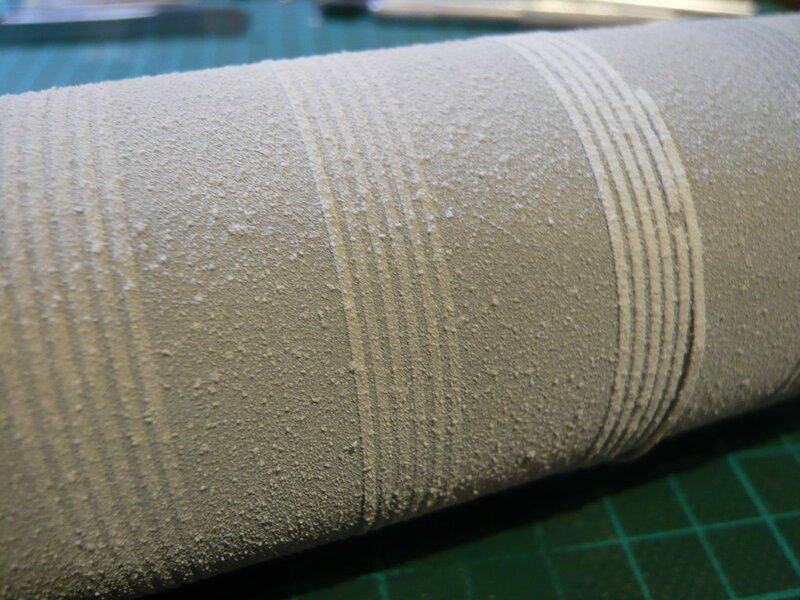 but I think that I do not have to apply a second layer of flour, but rather that a similar effect can be achieved by spraying a little more glue, so that more flour will stick immediately what should produce a thicker flour layer. Thanks EG for your comment too. As I said, I think that a more intensive spraying of the UHU Spray Adhesive will be the right way to go followed by priming and finally some thin airbrush layers of paint. now it was time to try the white Vallejo primer out of the can. By the way, it's been a felt eternity, since the last time I primed/painted something about which I can barely still remember ... 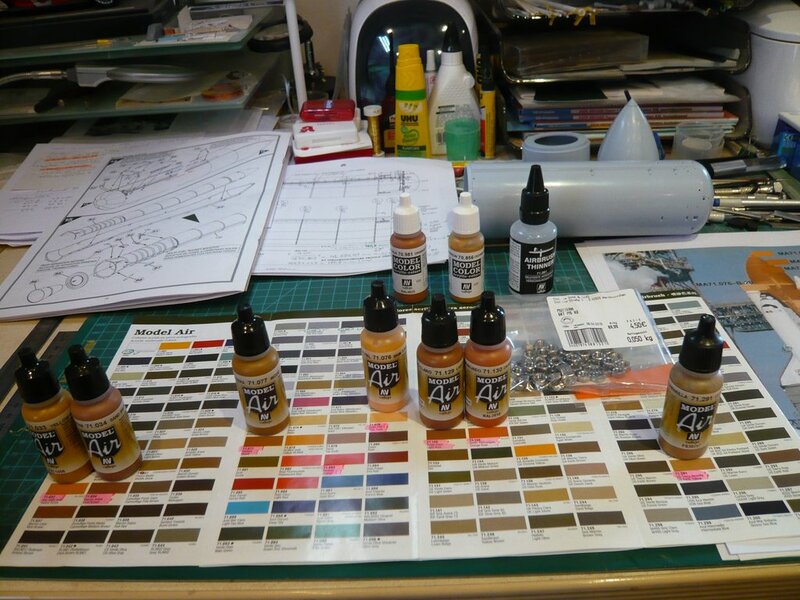 In addition, these are my first attempts with Vallejo colors/primers, which I want to use shortly. Each can of Vallejo primer contains two spray heads, namely a Pocket Cap for larger flow rates and medium line widths, ideal for larger surfaces, as well as a Skinny Cap for low flow rates, recommended for fine lines and small details, as one can read in the manufacturer's flyer. Since these caps are unfortunately not marked and their nozzle openings appear almost the same size, one has a problem or spoiled for choice. After a long search, I then still found pictures of both types, of which I then haave used the Pocket Cap (left). 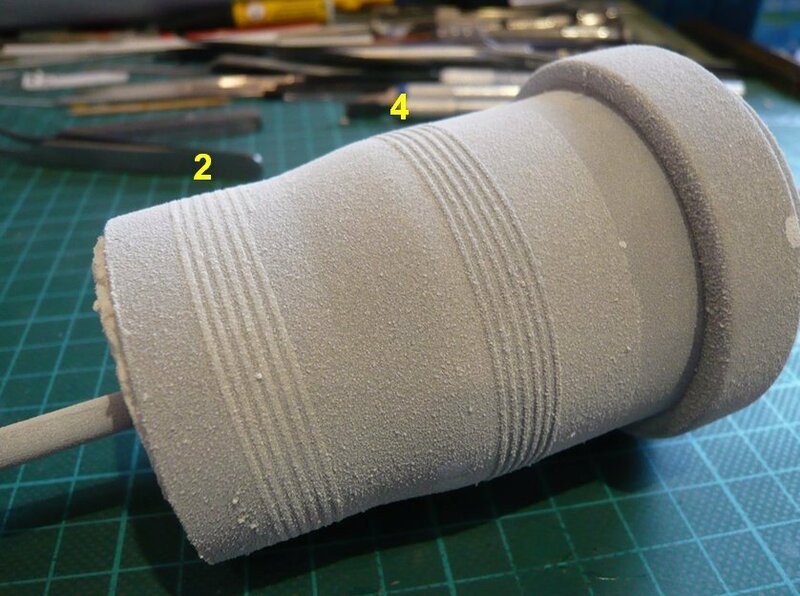 On this occasion, I then subjected my Suction device (Wiltec) to a first practical test, whereby I started with the small Dummy on the rotary spit. 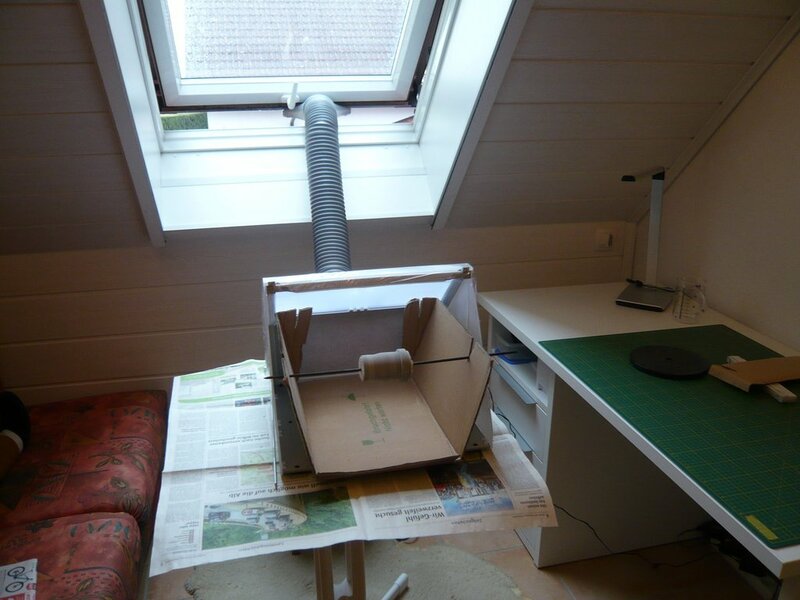 After switching on, the LED lighting comes on first, and then the fan comes slowly up, which is unmistakeable. After shaking the spray can for about 1 minute, I started spinning the spit and spraying, but it began quite fogging in because the Dummy was a bit outside the roofing. Maybe I should have used the Skinny Cap with the finer nozzle. 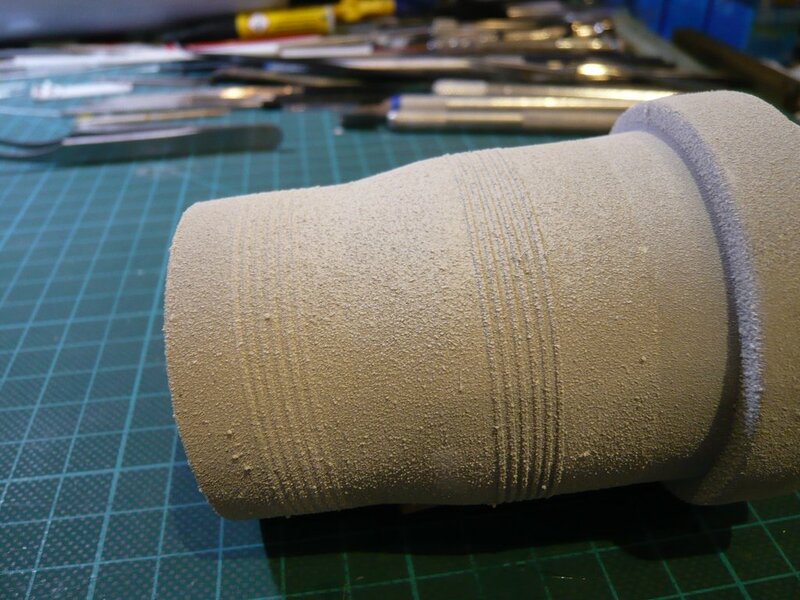 And this is now the result of the priming based on the Patterns 2 and 4. 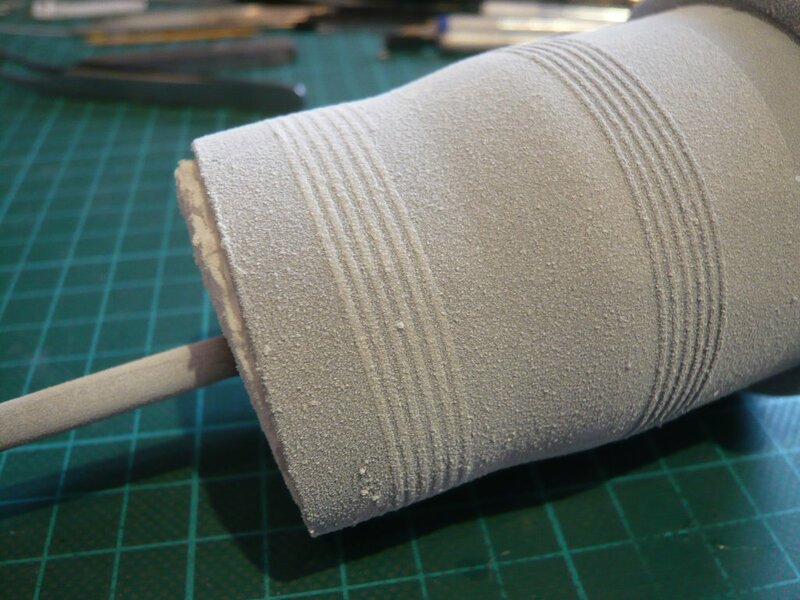 I think that the Pattern 4 with the double tape layer (0,5 mm onto 0,75 mm) seems to be a bit too raised, even though the surface profile will even further be leveled by means of the following airbrushing. 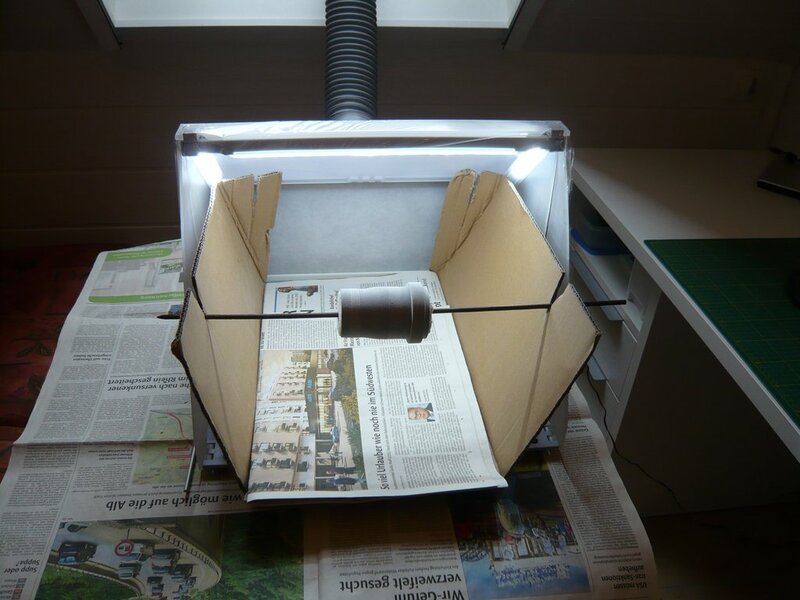 Since the primer layer seemed a bit too thin for me, I also sprayed a second primer to achieve better coverage, whereby I heated the can in the water bath before and shaken it for about 2 minutes. 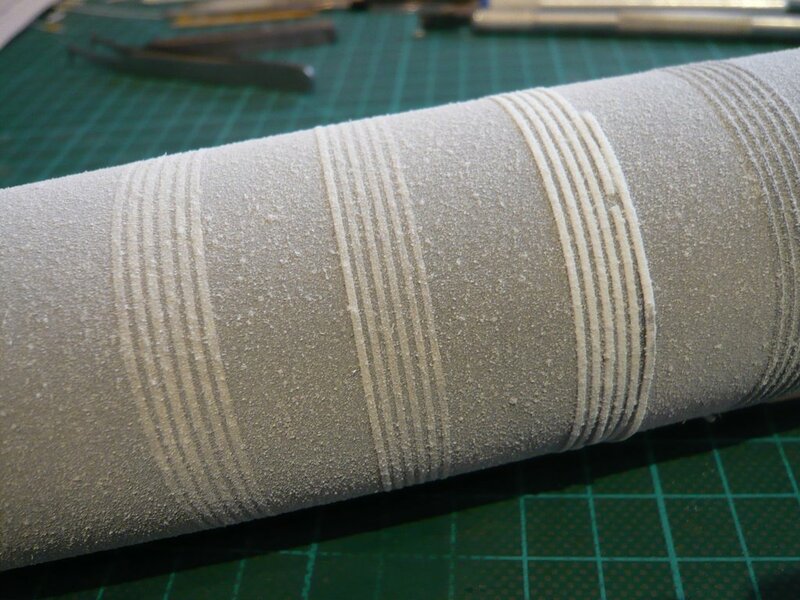 As one can see in this picture, the layer has also become noticeably denser, which means that the stripes of my favorite Pattern 2 are not so clear visible anymore. 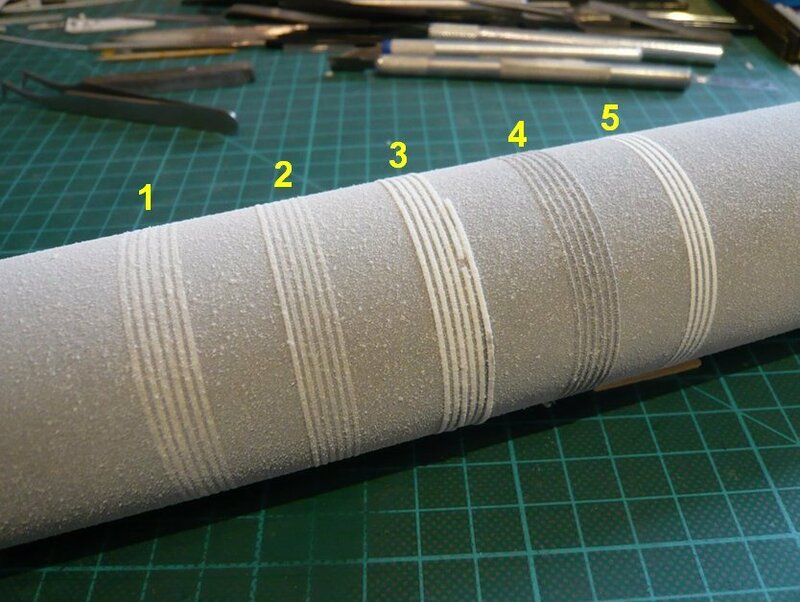 If I now still imagine a multi-layered airbrush finish above, then the surface profile could already go in the right direction, which comes closer to the original images of the SOFI pattern. 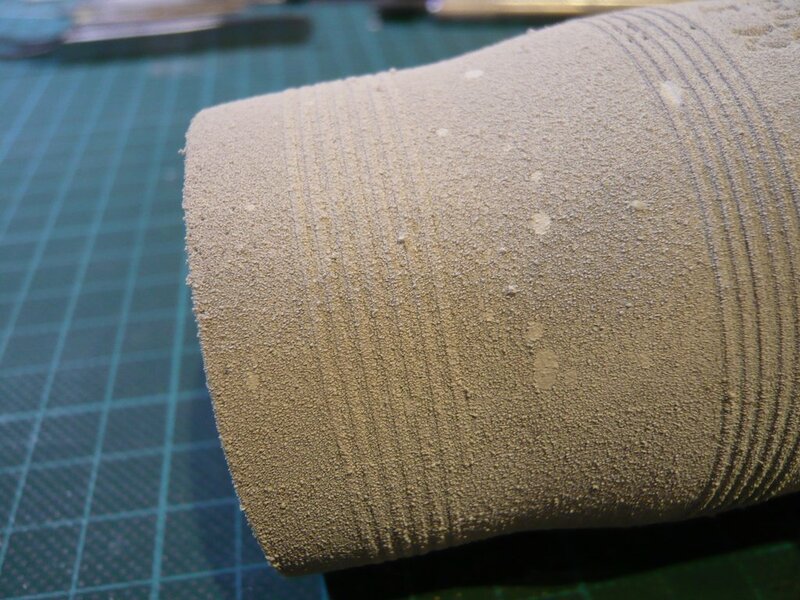 On this picture you can see the area in the lower part, which I had twice floured. 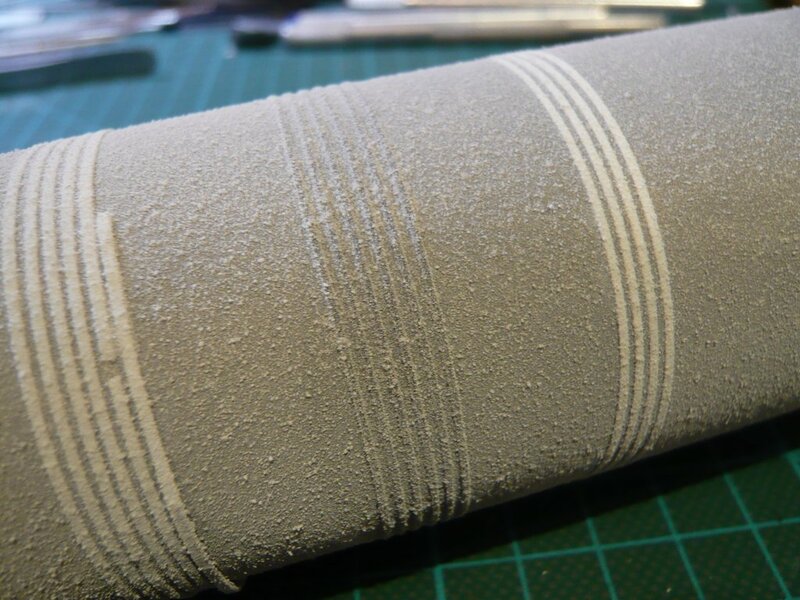 And this is now the larger Dummy with the five patterns after comparable (short) priming time, for which I had used the Pattex Spray Adhesive, which might not have had the optimal adhesive power, what led to a slighty too thin flour layer. 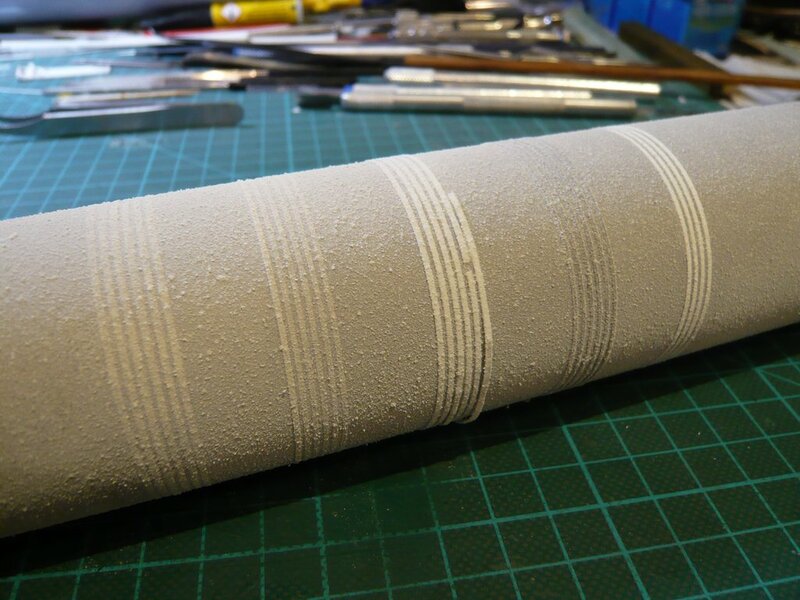 On this picture one can see, that at the Pattern 3 the MEK-gluing of the Evergreen Strips has partially resolved. And so it looks after the two-time priming. After all, what I have seen so far, I would prefer the Pattern 2. Now it remains to wait for the effect of the airbrushing, whereby I slowly have to think about the orange-brown color mixture, although for the test-painting initially a simple color is sufficient. Thanks EG for staying tuned. That's why I have to think about the orange colors for the ET soon. 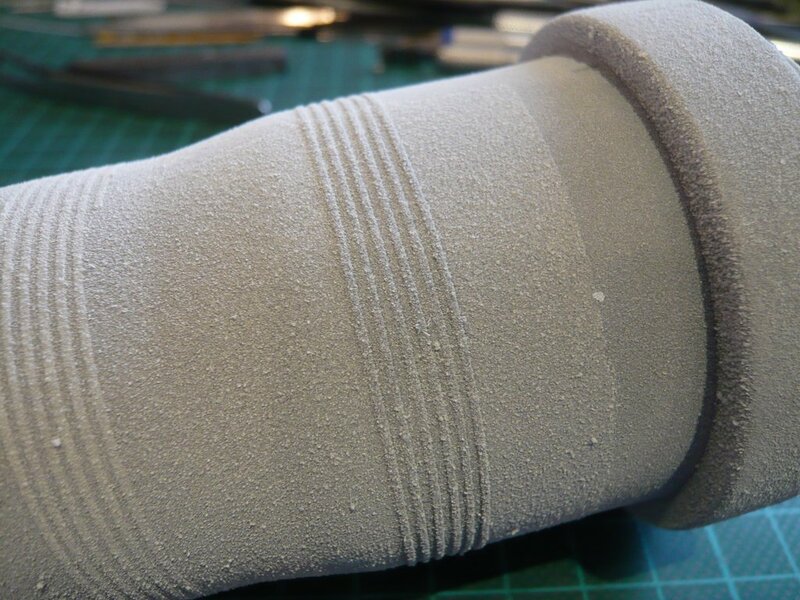 Then I can airbrush the dummies and compare the effect of the primed flour coating. with the orange-colored shades of the External Tank (ET) we have been engaged oftener already, and it is known that the increasing discoloration of the ET towards darker shades is related to solar radiation, the Shuttle stack is exposed to, while he is standing on the launch pad waiting for the launch. Consequently, one will not be able to get along with one hue alone, because the Intertank is darker anyway, but rather one needs some more or less intense orange-brown color blends, depending on which Countdown situation one wants to display on the launch pad, which is a matter of opinion. Originally, I had thought of the Countdown phase right before the launch for my Diorama and so far I had oriented myself by my often shown STS-6 Reference photo, on which the shades of the ET appear relatively bright, but without knowing which phase this photo comes from exactly. 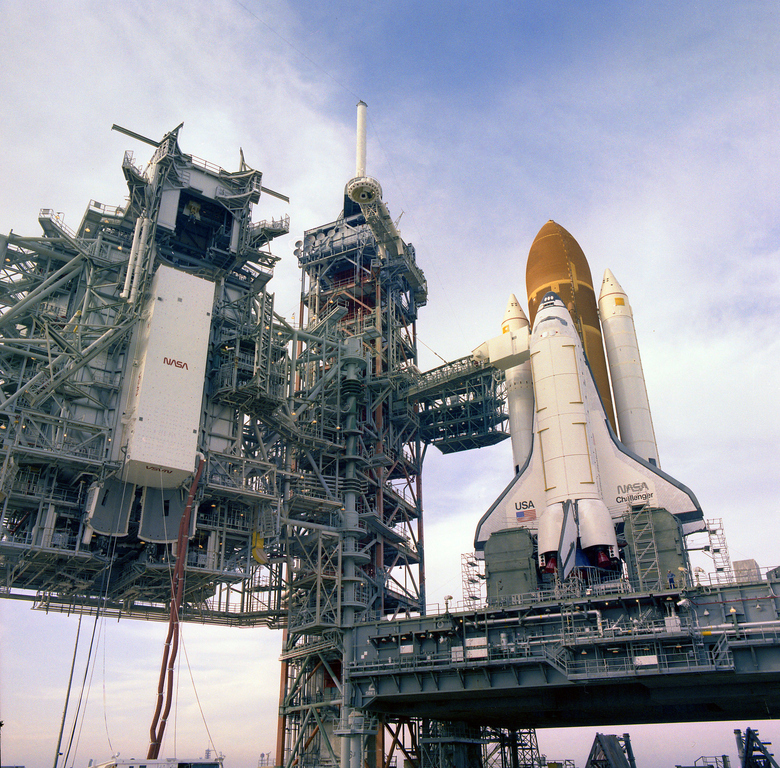 But since the Payload canister can be seen, the photo should be from the beginning of January 1983.
as well as during the Roll-out of the Challenger (30.11.1982), here in the fog shortly in front of the pad 39A. On this photo from the Lift-off (04.04.1983) the ET shades appear much darker, a detail that I did not attach much importance to for a long time, because the whole mood of the photo appears somehow darker, which might have been due to the weather or to the photo itself. 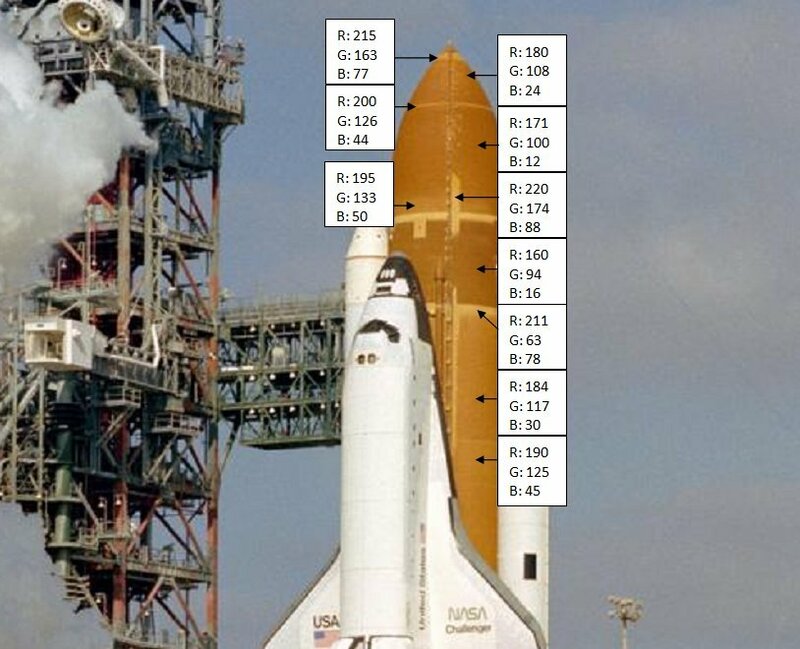 However, this strong discoloration of the ET becomes plausible given the unusually long resting time of the Shuttle stack on the pad, which at STS-6 in contrast to other missions with 4 months lasted much longer than originally foreseen, which would have been the main reason. 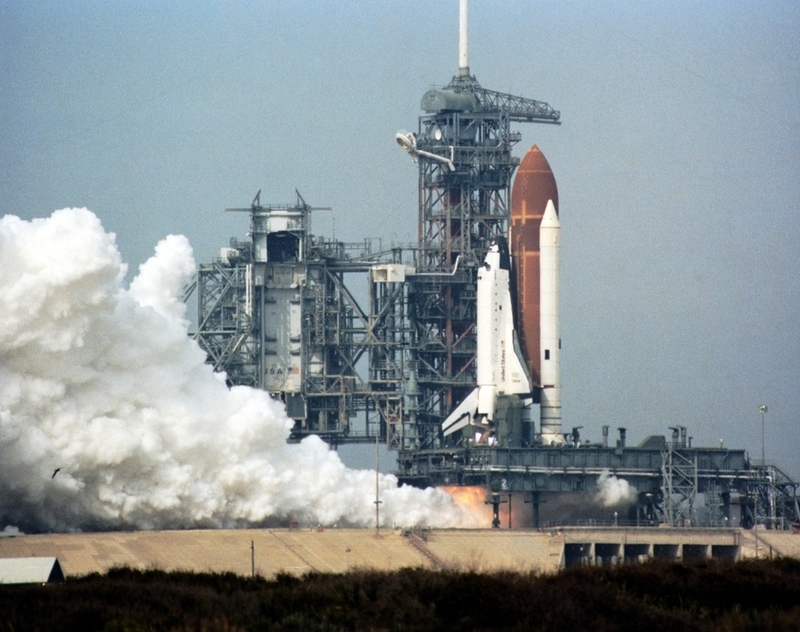 The reason for the delay in the launch, which was originally scheduled for the end of January 1983, was a hydrogen leak in the area of the main engine SSME No. 1 of the orbiter that occurred during a test run, Flight Readiness Firing (FRF, 18.12.1982), but which could not be localized exactly at first. In this Flight readiness test, which every orbiter has to complete before his maiden flight or after major technical overhauls, i.a. the three main engines are tested to prove their full functionality for approx. 20 seconds and then shut down. Here is an image of this FRF, which I initially thought was a launch image, but with its brighter color shades of the ET it does not fit to the Lift-off image with the dark hues, what has been pretty confusing me at the beginning. 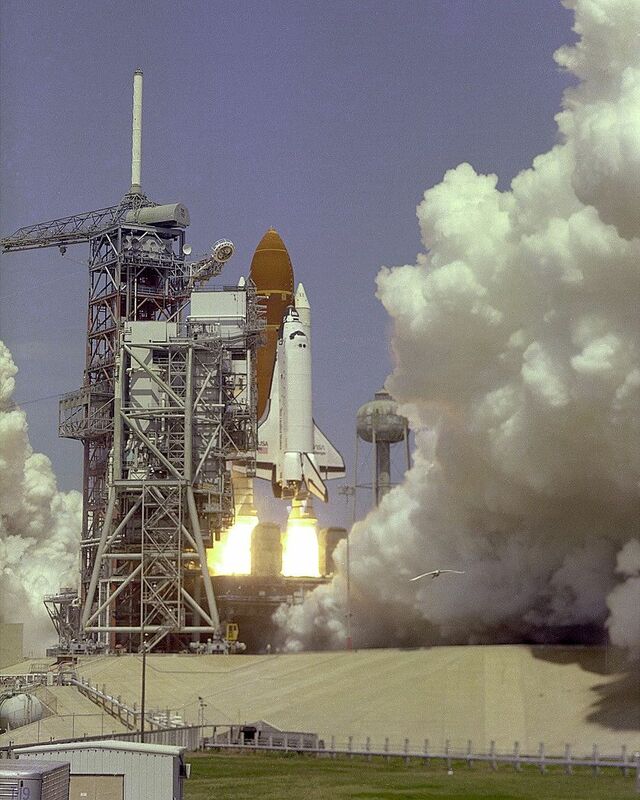 Luckily, in the NSF forum there is a special, very detailed and highly interesting thread Challenger STS-6 – A Walk into History with a lot of photos and information over the entire course of this first Challenger mission, which was a great support for me for understanding all the operations. This leak and its exact locating has kept NASA busy for quite a long time and led to a delay in the launch date, as major maintenance work had to be done on the orbiter's main engines. Therefore, it was necessary to perform another FRF test (25.01.1983), where it can be seen on this photo that the colors of the ET had darkened further. But even during this FRF, a hydrogen leak occurred, which was caused by a 3/4 inch long hairline crack in the combustion chamber manifold of the engine SSME No. 1. 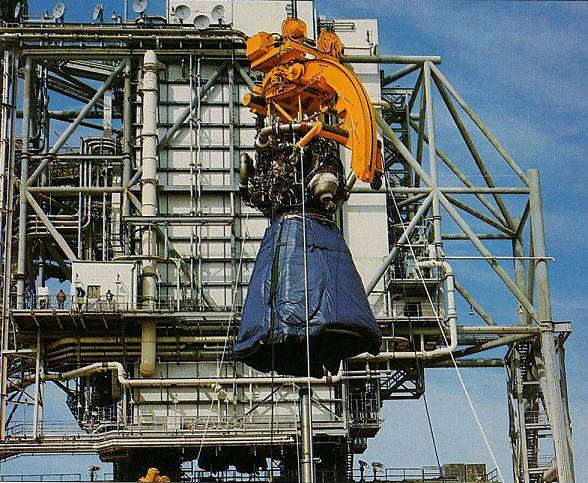 Since in the other engines further leaks occurred too, which were obviously a problem of the welds of these new engines, then at the beginning of March 1983, all three main engines were dismantled on the launch pad. While the welds at the two engines SSME No. 2 and No. 3 were reinforced, engine SSME No. 1 was replaced by a new engine whose welds were also reinforced for safety's sake. 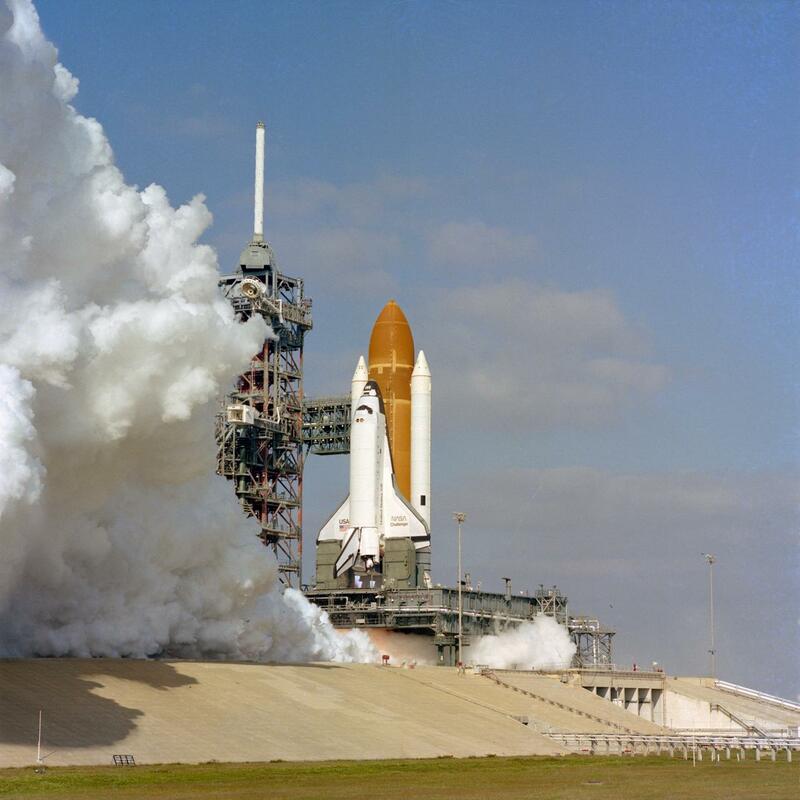 After detailed error analysis and a problem-free test of the last 16 hours of a normal countdown, the engines were reinstalled on 10.03.1983, after which the Challenger finally could start for her maiden flight on 04.04.1983. So I know now, when the ET-8 had which kind of shades, and I can decide accordingly, whereby today I tend but rather to the lighter shades. Excellent research Manfred. I commend your attention to detail and perseverance. Thanks Mike for looking in on me again. With my approach, the one conditions the other. and thus again back to the color shades of the External Tank, wherfore I've looked at my STS-6 Reference photo once again more exactly, to be able to assign them to the available Vallejo colors, whereto I am focused on the sprayable colors from the range Model Air (MA). 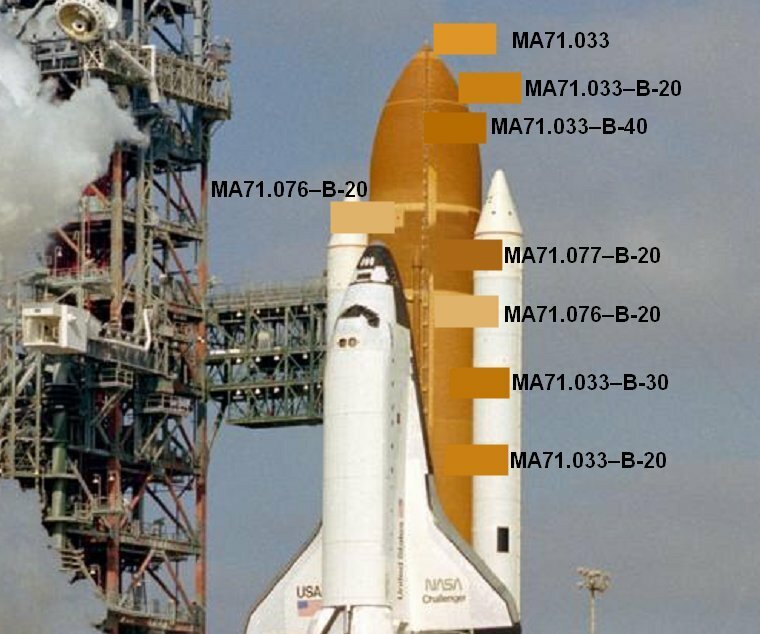 After careful viewing, I have come to the conclusion that this image is not so well suited for determining the color shades, since half of the ET is more or less covered by the shuttle or the right half of the ET is also still shaded. Therefore, I have now selected this photo of the first Flight Readiness Firing (FRF, 18.12.1982) for the further detailed consideration, on which the ET seems to be illuminated relatively evenly. 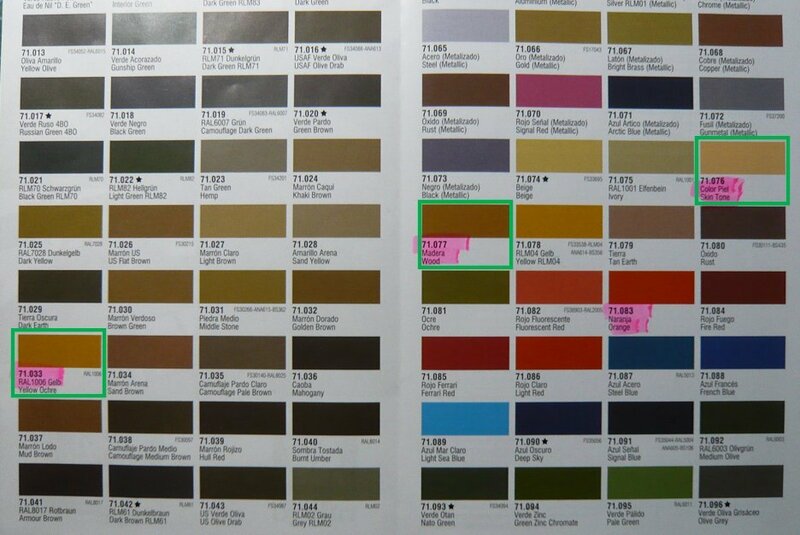 As one can see, the ET colors are in my opinion less orange-brown color shades than rather yellow-brown shades. First of all, I tried using my Paint Shop Pro (Jasc) to determine the RGB codes of the different color shades in order to get a better feeling for the colors. Concerning the indicated RGB values, it should be noted that the values in the vicinity of the destination vary slightly and thus can not be considered as absolute values. 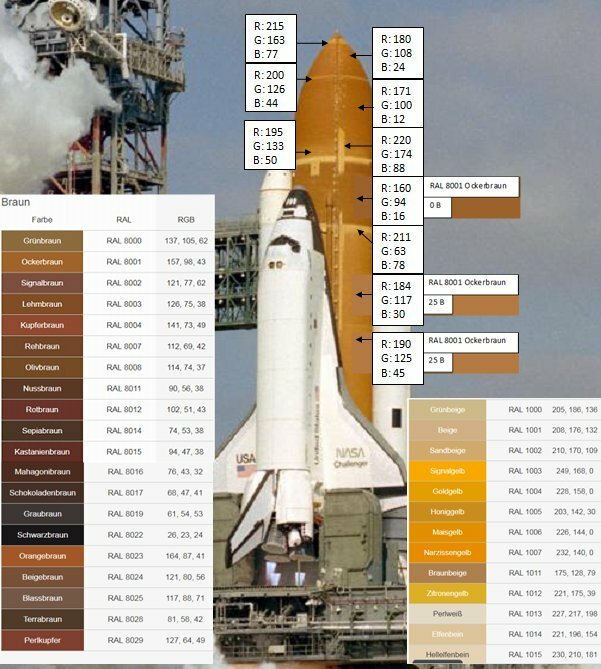 One can also consider the classic RAL Color Chart what I've tried in this image for three places on the LH2 Tank/Intertank based on the color Ochre brown RAL 8001. And as one can see, one gets quite close to the ET color shades by adjusting the brightness. In all these comparisons, however, it is important to note that even the normalized RAL colors do not appear completely authentic on PC monitors and the color rendition depends on the respective screen settings anyway, whereby color comparisons are complicated or have to be taken with care. Since one can not get any further with the RAL colors in the practical color selection, I finally got back to the Vallejo-Model Air assortment to find corresponding colors, which I then also can order. Thereby I came across the following three colors, whose brightness I then adjusted gradually, resulting in the darker shades. In this image, the selected color shades (marked blue) are placed on the appropriate places on the ET that match well with the ET shades. So I'll order these three airbrush colors first, and I'm curious how they even come out. The only question is, what other colors I should mix with the original colors to get the darker shades? Here is an overview of the Model Air colors, in which I have marked the three colors. 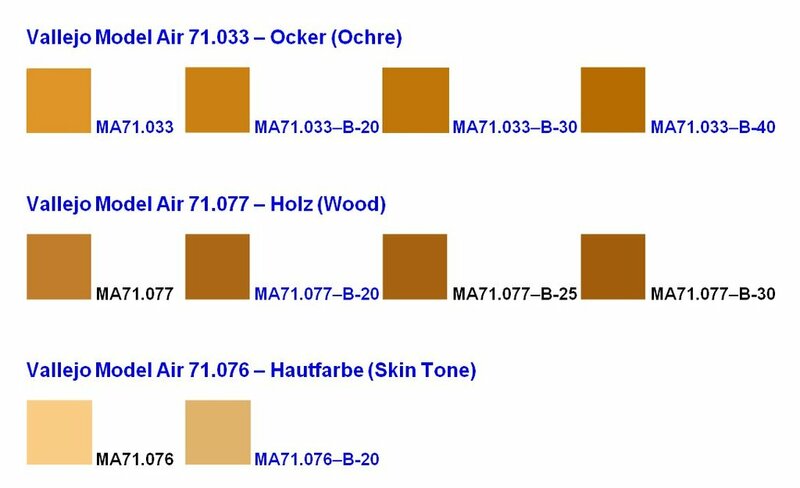 Perhaps for the MA71.033 and the MA71.077 the darker neighbor color MA71.034 would be suitable, and for the MA71.076 maybe the MA71.077? For useful hints or suggestions I would be grateful. Have you first removed colour cast from original photo you're trying to obtain colour values from. There'll be atmosphospheric filtering / blue perspective hazing due to the long distance between the zoom lensed camera and Shuttle stack. Full range shading can be clearly seen and it definitely looks darker in the shade and brighter in the direct full sunlight. there are subtle variations in each section so the color is not consistent across all sections. Thanks Wicky and EG for your helpful support. I think it will be important, that the ET should have no uniform color, but a smooth color shading, and all this should finally fit to the flour stripe texture, what's still going to be pretty exciting.